For as long as I can remember, I’ve been on the plump side of normal, and over the years, I’ve drifted further and further away from that coveted “normal” weight. For much of my life, I didn’t let it worry me much. I figured out that I’m just naturally on the heavy side, and there’s only so much you can do to fight your genes. I didn’t exercise much, and I didn’t eat a lot of veggies, although I did try not to overeat routinely. And my weight stayed in the overweight range. Once in a while, I’d read an article or diet book and give weight loss a try, but my heart was never in it, and I never kept it up for more than a day or two. About 10 years ago, my weight tipped over into the obese range, and I decided it was time to act. I got serious about counting calories, eating veggies, and exercising at least five days a week. And it worked! Until it didn’t. It’s the classic story. I hit plateaus that I’d try to power through, and it wouldn’t work. I went through a period when fitting in workouts became more difficult. I joined Weight Watchers online for an extra boost, and it worked. Until it didn’t. Eventually, all the weight I lost came back–and those pounds brought some friends. In a lot of ways, I did everything right when it comes to weight loss. I didn’t forbid myself any food, and I attempted to treat my diet as a lifestyle change, rather than a short-term fix. And many of the best eating habits I picked up as I lost weight have remained with me. Fruits and veggies are the foundation of my diet, and I work out 4 to 6 times a week. What I haven’t been able to sustain is the calorie counting. I tracked every bite I took for years, and eventually I couldn’t take it anymore. What made it worse was that attempting to eat non-processed foods meant that calorie counting took twice as long since the recipes I was working from or creating weren’t in the databases I used. Never mind that I didn’t even know how many calories I needed to eat anymore; those online calculators don’t all agree. All this background gives you an idea of where my mind was regarding diets when I picked up Intuitive Eating by nutritionists Evelyn Tribole and Elyse Resch. I’d been reading about IE for a while, but hadn’t gotten around to the book. The book outlines a way of eating that sounds like normal, natural human eating. It’s not about deprivation, nor is it about gluttony. It’s about listening to your body and learning what kind of food and how much is right for it. Eating when you’re hungry and stopping when you’re full (not stuffed). The first part of the book talks extensively about why diets don’t work and why so many people, despite their best efforts, cannot sustain weight loss in the long term. When you’re dieting for weight loss, your body learns to hold on to every calorie it’s given, in fear that there won’t be more. There are both physical and psychological forces at work here (and the psychological forces are more complex than a mere lack of will power–just because something’s psychological doesn’t make it less real). The authors share stories of their clients’ failed efforts at weight loss and discuss what these stories teach us about our mental and physical responses to dieting. As “correct” as my approach to dieting was in general, I was shocked at how familiar some of these patterns were. As much as I’ve prided myself on my overall discipline, the areas where I’ve slipped up have, I think, led to a greater overall intake of calories than if I’d just eaten what I wanted in the first place. Diet plans like Weight Watchers and calorie counting treat the body as an enemy, not to be trusted. Hunger is the body’s tactic for getting what it wants. One diet book that I read said that if you’re feeling hungry and have eaten your caloric allotment for the day, comfort yourself with the idea that you’re burning fat even as your stomach growls. Tribole and Resch, on the other hand, say to honor your hunger and give your body the nourishment it needs. This doesn’t mean gulping down three bacon cheeseburgers. In fact, honoring your hunger is a way to avoid a binge. By eating when you’re hungry, you’re less likely to overeat when you finally give in. And eating what you want can also prevent binges because you don’t keep coming back to the kitchen looking for something else to satisfy your craving. Go ahead and eat the cookie and be done with it instead of trying multiple cookie substitutes. These steps are, to some degree, sequential. It’s difficult, for example, to pay attention to nutrition without awakening the food police, so it’s important to have that step down before worrying too much about whether you’re eating enough leafy greens. One of my favorite things was the idea that we’re to treat our diets not as a set of rules but as an opportunity for “food anthropology” in which we make note of how different foods make us feel so that we can choose the best foods for us. For example, I used to eat a homemade yogurt every day at work, but then I noticed that I was always a little gassy afterward. Could I be lactose intolerant? Cutting out dairy showed me that yes, I am better off limiting my dairy intake. I’ve continued to experiment to learn what forms of dairy bother me most and how much I can handle. With that said, I did feel that the authors talked about weight loss more than I’d have liked. The library edition I read (the second edition) even included a height and weight chart meant to illustrate the wide range of acceptable weights that nearly sent me into a panic because I haven’t been in that range for almost 20 years! I’m no body builder, but I’m pretty sure I’d have to lose muscle to get down to that weight! I understand that the new edition has removed much of this type of information, which is a good thing, especially since I’d like to buy a copy to own. I love Dances with Fat! I’m trying to transition to an intuitive eating/HAES approach to eating, but it certainly is difficult. There is just so much cultural pressure to talk about “good” and “bad” foods and being a certain weight, etc. Isn’t Ragen great? Her blog has changed the way I think about so many things. And you’re not kidding about the cultural pressure. I’m lucky that I don’t have to deal with a lot of it in my day-to-day life, but I rarely get the congratulations and positive reinforcement I got when I was dieting. I really liked how personal you made this review, Teresa. I too have been changing my lifestyle over the past few years to one that focuses more on exercise. I’ve never been one to deprive myself of food, but I am trying to wean myself away from a heavy reliance on carbohydrates (which I love) and replacing those with more proteins. I’ve always had a very heavy veggie diet, so I’m one of those who is actually trying to add more meat. I think, though, what really drove me to it is that I like to be in control of things. There is so much in life that you can’t control that it’s nice to feel that you at least are in control of your body and how you treat it – not as the enemy, but more as an instrument that needs to be respected and tuned in order to work well for you in the long term. Thanks, Aarti. It felt good to write about this stuff, even if it’s a little scary. I don’t think I’ve said out loud that I gained back all the weight I lost plus more, and it’s tough to admit that! I’ve been working more protein into my diet too (not necessarily meat) because it does help me feel satisfied. But the early stages of IE focus a lot on permission to eat whatever, so I’m not cutting anything out unless I know it disagrees with me. The control thing, for me, is interesting because when I was dieting I totally felt in control, but maintaining that control was exhausting for the long-term. I think, now, that it wasn’t so much that I was in control but that I was letting the program I followed control me and my body instead of learning to work with my body to give it what it needs. My body is, as you say, an great instrument, worthy of respect. It’s not the enemy. Worse than the plateau is the upward incline, despite not going back to old ways! So frustrating! And I hope you find the book helpful. I’ve been feeling for a while that having a good attitude toward food and eating what feels right is more important than weight loss, and this book fully supported that view. I’ve just posted about my own diet too Teresa. Great minds think alike! I did lose a stone last autumn by doing exactly this kind of eating, but I plateaued in time for Christmas (Ho, ho), and have just now restarted, but using the Fast Diet (intermittent fasting 5:2). Having done my first two fast days, where you are limited to just 500 calories, they weren’t difficult, and on the days in between I think I naturally ate a little less than normal too which is all good news. I distrust any regime that demonises foods, and agree with you that there are huge psychological factors involved in weight loss and diet. So good luck with your own eating plans. I saw your post and am glad to hear the program is working well for you. It’s not a program I could sustain (and one I think the authors of this book would not endorse). For me, I get light-headed and very grumpy if I cut back too much–it’s kind of a frightening sensation! This route seems like the right path for me, and whether it leads to weight loss or not isn’t particularly important. Good review – and good luck with your new regime. (I don’t mean good luck, I hope you loose weight, I mean good luck, I hope you enjoy it and feel better on it!). I’ve had this book on my shelf since Sara Zarr talked about it years ago, but I’ve yet to crack it open, alas. No idea what edition I have, either. Glad to hear it makes sense to you overall, though! It does make good sense. It seems like the way eating is supposed to work. I hope you find the book helpful when you do get to it. I should probably read this, but I’m pretty sure that any useful intuition I might have ever had about eating was destroyed beyond repair by years of yo-yo dieting. My goal this winter was to try to not gain back the final ten pounds from the 80 I had lost a couple of years ago. My aim is to be able to walk, which is no joke with a five-year-old artificial knee. I have that same fear about having lost my intuition. Right now, I’m asking myself whether I’m physically hungry before eating anything, which is key for me because I tend to eat mindlessly. But knowing when I’m satisfied is a whole other matter. I eat past fullness too often. And I’m so sorry to hear about your knee problems. I know how miserable that can get. I’ve had occasional bouts of patellofemoral syndrome for years and have had to rethink my exercise regime because I got to the point last year that I had to use my arms to drag myself up the stairs to my apartment. It was scary! I was really lucky that physical therapy helped me, but I have to stay on top of the exercises to keep the pain at bay. I am adding this book to my reading list – thank you. Reading your review reminded me of Anne Lamott’s Traveling Mercies, where she talks about learning for the first time what hunger feels like, and listening to her body, in order to feed herself. I had the opposite situation, of learning what full feels like – not stuffed, but full – and I think that might be related to the satisfaction factor. I know exactly the piece you’re talking about. She talks about wetting the Doritos (I think it was) so she won’t eat any more. The self-talk she goes through is exactly what this book teaches. I think the satisfaction factor is going to be the most challenging step for me. I don’t need to be stuffed to be satisfied, but I eat too quickly and mindlessly to notice that I’m satisfied before I get stuffed. I’ve noticed that eating while reading often leads to mindless eating – similar I guess to the effect of eating while watching TV, which I’ve read about many times. It does come down to mindful eating, in so many ways. I totally agree with those Ten Steps. If we listen to what our bodies are telling us and forget about weighing-in and calorie counting, it all seems to fall into place. I’m a vegan and don’t have weight issues now, but I used to be anorexic, which is a whole other thing. I’m mindful of what I eat and pay close attention when I’m eating, and my goal is to be healthy, rather than to maintain a particular weight. Also, remembering that it takes a lot of exercise to burn up that piece of chocolate or whatever, helps me to make better choices. I was brought up to eat every morsel on my plate, or else I would be punished and made to sit there until I had eaten everything, so it’s hard to stop eating sometimes when I’ve had enough because that whole not wasting food thing is so deeply engrained. Our issues with food are complex, but the ideas in this book sound like common sense and offer practical guidelines towards establishing a healthier eating pattern. Good luck with it all, and good on you for writing about something that is often very difficult to talk about. It’s amazing to me how our dieting culture has made such common-sense ideas so hard to follow. We get such engrained ideas that are hard to set aside. I have issues with not wanting to waste food, even if I don’t like it, because wasting food = wasting money that I spend on the food. I went on my first diet at six years old. There followed almost half a century of the dieting cycle: Diet/lose some weight/start eating “forbidden” foods/say “forget you” to the diet/eat everything I want/gain back all the weight I lost, plus an additional ten (or twenty), until I found myself at 54 in my doctor’s office trying to find the cause of chronic fatigue and vertigo and hearing that I had diabetes and would have to start using insulin. For whatever reason, that was the trigger I needed to finally find a way to eat right. I had always been proud of the fact that whatever I weighed and even through pregnancies, my blood levels were always good. Now I had to face the fact that 50 years of poor eating choices were having consequences. The plan I’ve been following is Dr. Joel Fuhrman’s Eat to Live and Super-Immunity. His belief is that diets don’t work because when we diet we basically eat the same high-calorie/low-nutrient food but in smaller portions. Eventually, no matter how good our will power, our deprived bodies will instigate a binge–and we’re back on the roller coaster again. He advocates an essentially vegan food plan–eating lots of vegetables (raw and cooked), fruits, and beans, with healthy fats in small quantities (raw nuts, seeds, avacadoes) providing the fat nutrients that we do need. After a year on the plan, I’ve lost over 40 pounds, but much more importantly all my blood levels are back in normal range and other problems–such as arthritis in my knees and hips–have also lessened. His website is http://www.drfuhrman.com. I don’t mean to sound like a testimonial ad, but the plan has really helped me. The authors of this book talk a lot about that binging cycle when we’re feeling deprived. I couldn’t believe how well their descriptions matched my own experiences. And the idea that it’s not about will power are spot on. I’m glad to hear you’ve found a plan that works for you. I think finding a way to eat that’s satisfying without being routinely overindulgent is the key. Have you ever read Eat, Guilt, Repent, Repeat? 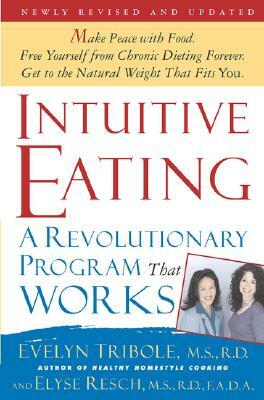 I came across this book before Intuitive Eating – but it does make reference to it there’s more to it which I really found helpful in changing my unhealthy relationship with food. It went deeper where you find out how forgiveness and gratitude changes things. It was life changing for me! I haven’t read that, but the title is great. It captures the whole cycle of diet, last supper, diet, etc., perfectly. I’ll look it up!